Back in the early 2000s, I was at a party when one of the guests mentioned he was hooked on podcasts. “Huh?” was the primary response, as few of us knew what he was even talking about. My, how things have changed. Today, nearly two-thirds of Americans are familiar with podcasts, according to the 2018 Infinite Dial Study, and 44 percent of Americans age 12 and older have listened to one. Consumers ages 25 to 54 are most likely to listen to podcasts — almost one-third of them do. Here’s how your small business can benefit from podcasting. The 2018 Infinite Dial Study names podcasting one of the biggest audio trends for 2018. Widespread smartphone use, as well as an increase in the number of connected cars, are big factors in podcasting’s growing popularity. An estimated 83 percent of Americans now own a smartphone. And, according to Nielsen, the use of smartphones to download and/or listen to podcasts rose 157 percent between 2014 and 2017. More than 30 million Americans listen to podcasts each month and 21.9 million do so each week. Weekly listeners listen to an average of seven podcasts per week; 80 percent of them listen to all or most of the podcasts they start. With such high levels of engagement, podcasts are an ideal medium for savvy entrepreneurs to promote their businesses. Set your goal. What do you want to achieve with your podcast? Do you want to become known as a thought leader, drive customers to your website, or make connections in your industry? Your goals will drive the format and content of your podcast. Find your niche. There are tons of podcasts out there. How will you make yours stand out from the crowd? Determine who your target audience is, and then listen to the most popular podcasts aimed at this audience. Where is there an opportunity to provide something new? Choose a name for your podcast. The name should include some keywords. Using keywords in your podcast name, as well as online descriptions of it, helps users find it online or with a smart speaker. Plan your cadence. Creating a quality podcast takes time. You’ll need to come up with topics that you can talk about for 30 to 60 minutes. If you plan to interview guests, you’ll have to find them, convince them to participate, record an interview, and edit the recordings. It’s also a good idea to launch with several podcast episodes — not just one — so listeners who like the first episode can keep on listening. Market your podcast. Let your customers and prospects know about your podcast. Include a link to where they can download your podcast on your business website, in your email signature, in social media posts, and in marketing emails. Consider buying airtime on complementary podcasts to advertise. Your guests can also help promote your podcast by linking to it on their websites or mentioning it during their own podcasts. Get subscribers and reviews. Encourage your listeners to subscribe to your podcast, and to review your podcast wherever it’s hosted, like on iTunes. The more subscribers you have, the more impressive your podcast will look to new listeners. Positive reviews will also help convince potential listeners to give your podcast a try. 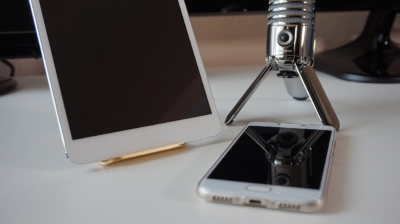 Even if you don’t launch your own podcast, you can still benefit from the podcasting trend. Find podcasts your target customers listen to. Then advertise on or sponsor those podcasts. You can also connect with podcasters who target your customer base and — if relevant — offer to be a guest on their show. For example, if you own an accounting firm catering to small business owners, see if you can get a guest spot sharing tax tips on a small business podcast. With a little thought and planning, podcasting can be an effective marketing tool for your small business.